There are plenty of inroads when approaching this dish but to do it justice, you may have to drum up a certain amount of bravery, summon a great deal of patience and probably get over a dash of skepticism along the way. The first hurdle is to try and find, if you can, a good, free-range, preferably organic, chicken. A chicken that still has it's head and feet intact. Like this one. OK, if you can settle for buying a decent chicken with its own giblets, stuffed inside, in a little plastic bag, then that's fair enough. However, I do find that these days that they are often hard to come by. Even in some of my local butchers, I can go in and find that the vast majority of chickens they sell are, giblet-less. Where have all the giblets gone? I do not know. We've turned, sadly, into a giblet-less society. But for this dish, you will need them, especially the chicken liver. I bought this one from The Ginger Pig at Borough Market, more out of curiosity to see what my children would make of it and their response was fairly muted. Their response was more of a case of 'Bore off Dad, we've seen all of this before.' And I am glad that they're happy to say that sort of thing. A lot of kids and adults will be turned off completely by the notion of a chicken actually coming with a head and feet. If this unsettles you, then just buy a regular, prepped chicken and buy some chicken livers separately. Be brave. Next, this is a recipe gleaned and adapted from the mighty tome that is the Larousse Gastronomique. Often to be found gathering dust in far flung corners of kitchens up and down the land. You are about to embark on some 'classic' French cooking and when it comes to creating the sauce for this dish, you will most certainly need patience. The stock takes at least an hour to simmer away on the stove and then you've got to get on with the business of reducing the stock and then adding some more ingredients, and then reducing again. You will need to set aside an afternoon of pottering and dithering and the title of 'Slow roast chicken' is a bit of a misnomer really. It's should be called 'Slow Sarson's vinegar gravy.' But that sounds sort of odd. Thankfully, the chicken gets roasted quickly, in a pan. Or should that be fried? Fried and poaching, that's what happens here. 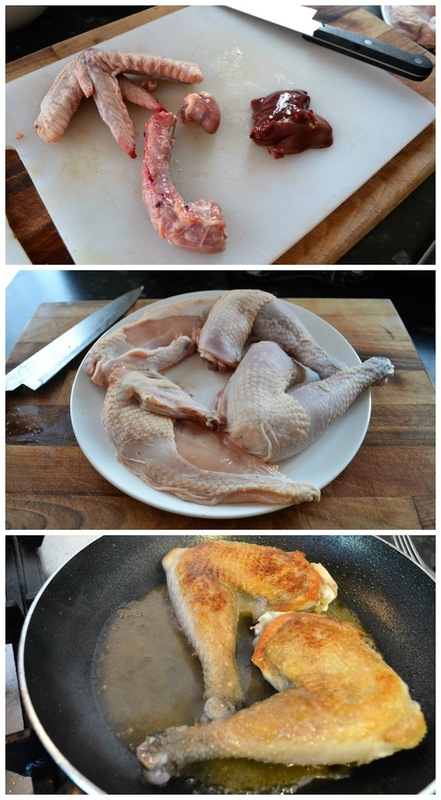 You engage in some frying and poaching, or 'froaching' to cook the chicken. It really is a good technique. Although I believe it's called something else. Finally, and this is where you need to dispense with the skepticism, the vinegar plays an important part in this dish. I mention the livers, well they are blended up and added to the sauce, or gravy, right at the very end. Which sounds all rich and delightful but without the vinegar, it can smack too much of cloying iron and give off a metallic, bitter aftertaste. Adding the acidic, malt brew balances things out nicely, to make warm, slightly tart but very delicious gravy. After adding, don't get your nose too close to the pan at first, otherwise you will blow your nostril hairs off. Trust me. 1. Melt 30g of butter in a large saucepan over medium heat. Add the giblets and brown them off for a few minutes before taking out and putting to one side. 2. Add the carrots, leek, celery, onion, garlic and bouquet garni and stir through for about 8-10 minutes, until everything starts to soften and caramelise. 4. Add a litre of water and bring to the boil before reducing to a gentle simmer. Cook for a further hour or so. 5. For your julienned vegetables : Melt 30g of butter in a saucepan over medium heat, then place the carrots and celery in the pot and turn them in the butter. Reduce the heat to a simmer, cover with lid and leave to steam for 10 minutes. Add the courgettes, mixing to coat in butter and cover with lid, to cook for another 5 minutes. Julienned vegetables should be soft. Keep warm. 6. 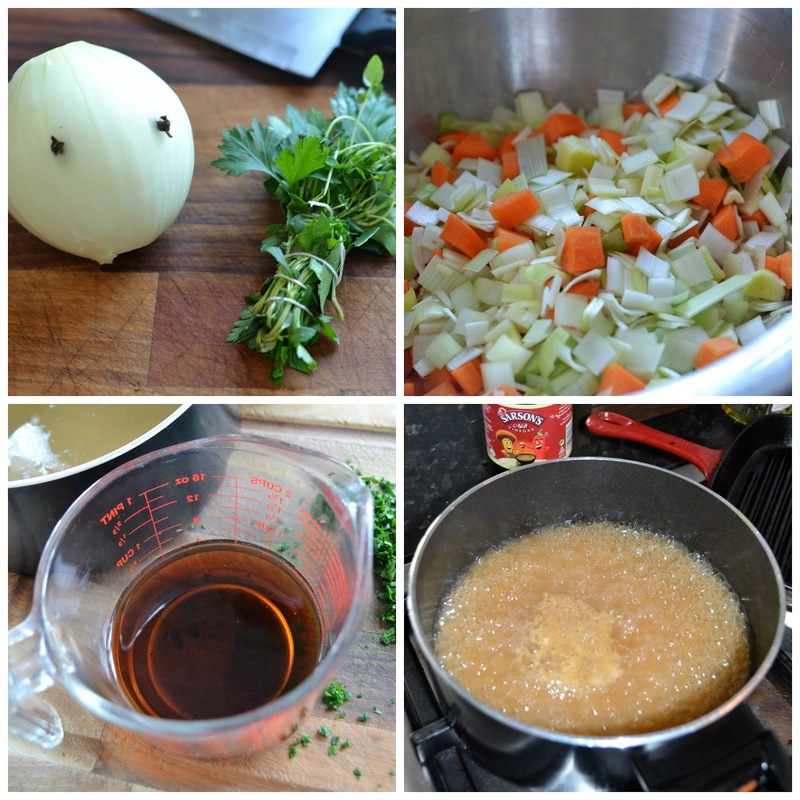 To begin developing the sauce, drain the giblet and vegetable stock from the saucepan through a sieve into a clean saucepan, holding back roughly 250mls of stock and pour it into a separate jug. Remove the liver/s and keep to one side. Place the clean pan back on the hob and start to reduce the stock by half. 7. Whilst that is happening, place a large frying pan on the hob with a good drizzle of olive oil, over a medium to high heat and season the chicken pieces with salt and pepper. First place the legs in, skin side down and begin to brown for a couple minutes and then add the breast pieces and leave for 5 to 7 minutes, so that the skin crisps up. Turn over and then add the 250mls of stock held back. Reduce to a bare simmer and cook for a further 10 minutes. The idea being that the underside poaches gently in the stock, whilst the top side remains crispy. 8. Go back to your gravy pan and when it has reduced by half, add the Sarson's vinegar and continue to reduce by a third. 7. In a small separate pan heat 30g of butter and once melted, add the flour to make a roux. Stir through thoroughly, making sure the flour has cooked off and then add a couple of ladles of the stock to mix in and then transfer everything back to your gravy pan. The sauce begin will thicken immediately and continue until you’ve transferred all the stock to make a lovely, luxuriant and tangy sauce. 8. Remember that chicken liver? Well now is the time to place that into your gravy and blitz with a hand blender. It should turn everything a bit creamy but if you are worried about any tiny lumps remaining, just pass through a sieve. 9. To serve, joint each chicken piece further into two and spoon a generous helping of vegetables into the centre of each plate, placing two chicken pieces on top. 10. Warm the sauce through, adding the remaining chilled cubes of butter to stir through and add a sheen. Drizzle all over the chicken and around the outside, finishing with a sprinkling of chopped parsley. oh god I adore this recipe... using the whole chicken, offal included was standard practice when we were growing up... but I tells ya, that chicken is definitely not resting. belleau kitchen - Thanks Dom. I should have added that the chicken carcass should be used for extra stock. Waste not, want not. That is a nice looking chicken!! Very straight legs, no rush to market!! That is a might fine looking plate of food, think I'll pass this one to my house mate who makes our Sunday roast, looks great!